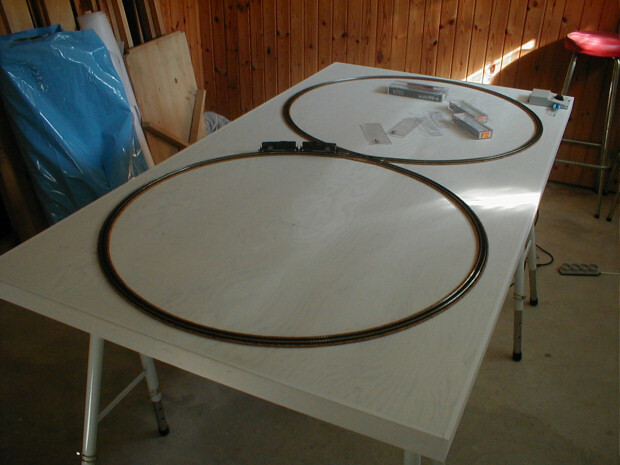 I have built a test track shaped as a figure eight for test running locomotives and speed matching DCC decoder equipped locomotives. By using a figure eight a locomotive will run trough both right and left hand curves and thus wear evenly. The curve radius is appr. 400mm so that all equipment may be test run. The track is nearly exactly 5 metres long, and using a stop watch I can measure the time it takes a locmotive to travel for example 10 rounds equal to 50 metres. I can then calculate the speed. Photo of the test track set up in the basement. The test track is built on a 9mm pine plywood sheet the edges of which is strengthened with pieces of 9x44mm and 21x21mm pine stripwood glued on. Underneath the sheet is strengthened by pieces of 9x33mm pine stripwood glued on crosswise and diagonally. The diagonal pieces of stripwood has a large stiffening effect on the sheet. The track is Peco code 80 flex track and the crossing is Roco code 80 with 30° angle laid on 3mm cork strips. The flangeways in the crossing is spaced to NEM standards and hence are a little wide for my US equipment, but as I have designed the test track with lengths of straight track before the crossing it works well enough. Drawing of the test track on a sheet of plywood.